Son of Chandler Newell and Marion Huldah (Martin) Thomas, John Martin Thomas (1869–1952) was born at Fort Covington, New York On December 27, 1869. Prepared for college at Franklin Academy, Malone. He entered Middlebury College in 1886 as a member of the Class of 1890. Member of Chi Psi and Phi Beta Kappa. Upon graduating from Middlebury, he entered Union Theological Seminary in 1890. In 1893, he was ordained pastor of the Arlington Avenue Presbyterian Church in East Orange, New Jersey, serving in that role until 1908, when he accepted the invitation to become the ninth president of Middlebury College. In his thirteen-year tenure as president of Middlebury, Thomas oversaw an ambitious fundraising program, and the founding of two of its most prestigious institutions, the Middlebury College Language Schools in 1915 and the Bread Loaf School of English in 1920. In addition, he guided a rapid expansion of Middlebury's main campus from five buildings to ten. McCullough Gymnasium (1912) Voter Hall (1913) Mead Chapel (1916), and Hepburn Hall (1917) formed the edges of what is now Middlebury's Main Quadrangle, and Pearson's Hall (1911) became the first building constructed for the women's college. On May 18, 1893, John Martin Thomas married Sarah Grace Seely, daughter of Henry Martyn Seely, esteemed Middlebury professor of Chemistry and Natural History. Thomas and his wife had five children: Marion Sarah, Huldah May, Henry Seely, John Martin, and Sarah Grace. In 1917, following the death of his father-in-law, Thomas and his family moved into Seely’s residence at 3 South Street, which has since remained the official residence of Middlebury College presidents. As Middlebury College President, Thomas followed the path set by his predecessor in planning for Middlebury’s entry into the 20th century. Not only did he pursue the ambitious building projects listed above, he also aspired to guarantee Middlebury’s position among the most respected New England institutions of higher education. He wrote prolifically about education, especially in terms of Middlebury’s educational vision, and was major player in Vermont historical and cultural institutions. He was a member of the Vermont Commission for the Tercentenary of the Discovery of Lake Champlain (1908-11), and served as Chairman of both the Vermont State Board of Education and the Commission on Conservation of Natural Resources of Vermont (1910-12). 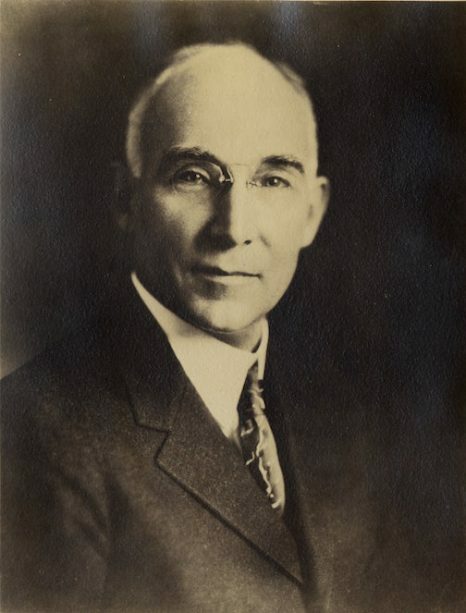 Perhaps the most unique roles undertaken by Thomas while serving as Middlebury President , was as a US Army chaplain, including Chaplain, Vermont National Guard, First Infantry, 1913-1916; service on the Mexican border, July-August, 1916; and First Lieutenant, U.S. Army, 1918-1919. Thomas resigned the presidency of Middlebury College in 1921, to accept the invitation to become the ninth President of the Pennsylvania State College (now a University). He went on to serve as the twelfth president of Rutgers University for five years, 1925-1930. Between 1930 and 1938, Thomas served as Vice-President of the National Life Insurance Company. In 1937, he was invited to become acting President of Norwich University, Vermont, replacing President Porter Adams, and in 1939 was himself elected to the presidency, serving in that office until 1944. John Martin Thomas died on 26 February 1952, in Rutland, Vermont. © 2012 The President and Fellows of Middlebury College. All Rights Reserved.